Believing it to be a way to bypass any adverse effects from the Millenium (aka Y2K) bug, a number of people embarked on specially organised millenium cruises at the end of 1999. 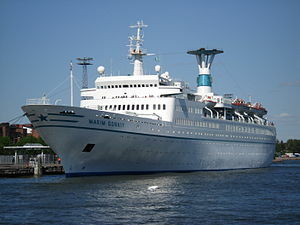 Despite many modern cruise liners still being heavily dependent on computers to operate, there was a belief that a ship, out to sea, provided a self-contained and controlled environment free from any disasters that might happen due to clocks not allowing computers and other devices to operate after midnight, 2000. In many cases, the deposits were taken months in advance and were non-refundable. The charter of one of many such ships was managed by the owner of the little cottage we stayed at in Wales for the week of the Royal Wedding: one Beat Wehren. It was sold as the cruise to end all cruises – an exclusive circumnavigation of the globe for the first four and a half months of 2000. The ship chartered was the Aegean I and had a capacity of 500 passengers, stopping off at many renowned ports around the world, with all 500 guests staying the entire journey. So the truth be told, it was not quite John Masefield’s romantic ideal of heading down to the sea, finding a good ship and a star to steer her by, before sailing off into the sunset. “Also, even in the calmest of seas, things can go wrong”, Beat merrily regaled us on our last night there in the safety and inland comfort of our cottage in Wales- relatively far from the port of Fishgard where the cruise ships used to leave from. The World Cruise Company was one of those cruise lines that had committed itself to the safety and comfort of an elite clientele who wanted to get to know each other well – perhaps even doing business together – while sailing the high seas around the world. A high price was paid for a berth on what was touted as one of the most exclusive passenger trips going. The Aegean I is not a large cruise liner by modern super cruise liner standards and so the roll of a ship that size is noticeable when the weather gets a little rough. However, when seas got especially high one night – as a storm was due to break – Beat was called out to get some of the foolhardy crew to come inside as the waves got higher and higher, threatening to break over the bow of the ship. The challenge Beat had was that the crew had been recruited from the Greek Islands, and so were more used to hopping short trips from island to island in the Aegean and Mediterranean where the ship was never far from land and the seas never got as high as they could be in the storms way out in the middle of The Atlantic or Pacific Oceans. Occasionally Mediterranean seas would get rough, and the ship would roll, and these guys would ride them out on deck – like the tough sea-farers that they had touted themselves to be in taking on this ticket – while the passengers stayed below. This experience was different however. Suddenly as the first big Atlantean wave broke over the bow – washing the crew from one side of the deck to the other, agreement was at last struck that it was best to take refuge inside. The heady rock and roll of the high seas was not all there was to contend with however. The passengers were conscious of their schedule to stop off at various places along the way, perhaps following a little too much adventure on the big ocean waves, and were just as interested in navigation along the way as the captain ought to have been who had mistaken the GPS that Beat had bought as being a very fancy satelitte phone. There was an element of Basil Fawlty cruises in how Beat told us this. Perhaps moreso when he advised what happened midway across the Pacific when a call came from the captain to say that the money from the charter company had not come through. The ship, at that point, had been steaming across to the Seychelles Islands and Mombassa. With the money not having been received from the charter company, the captain had been advised to turn back towards the Red Sea instead. Beat had managed to stop that happening by getting the ship to sail in a wide bow, while waiting for the call back from the owner of the charter company to confirm payment had gone through. Also at that point, fancy footwork had to be used by Beat to not alarm the passengers, as some had become savvy to how the ship had already cut short its stay at some of the places along the way due to delays – including travelling through the Panama Canal by night – and so were now using their own means to work out where the ship was at with its Greek ferryboat crew, who were clearly not so sure on what to do. Finally the call came, and the ship resumed its course due to payment being received – and with the passengers largely none the wiser in how their cruise had nearly come to an untimely end. Despite all this happening, and the company ending its days not long after that great ship’s return, the passengers of Aegean I’s Millenium Cruise still hold annual reunions – perhaps as a testament to how a shaky sea passage, as much as a pious pilgrimage on land, can lead to an experience to bring posh people together and change lives through providing stories they can dine out on for at least ten years to come…. Of course, Beat also had a perspective on the trails in Wales that we had found to lead us down to the sea – and exactly where those trails ended, and new ones began elsewhere – however, to keep in the spirit of John Masefield (as stated in my previous blog), that really stands as a tale from a fellow land rover rather than a sea-farer. So let’s drive on as far as the land takes us, perhaps even to where the sun sets and the ocean meets the sky! The term “posh” comes from those who had the best cabins on cruise ships – as it refers to those seeking to get the cabins on the opposite side to the port where unmentionable was often dumped – so Portside Out – but being able to see the land first when the ship came into harbour and before it berthed – as in Starboard Home. So, given they all considered themselves to be members of the gentry, I wonder who was POSH on the Millenium Cruise? Maybe there’s not just one single Chaucerian seafarer’s tale but a whole yarn that would lead a John Masefield to set sail (or not as the case may be!). This entry was posted in Fishgard, Travel, Wales, World and tagged cruise liner, cruises, millenium, seafarer. Bookmark the permalink.